Their faith was further tested when doctors at a West Valley hospital couldn’t determine the cause of Bill’s condition or prevent it from worsening, despite extensive testing and round-the-clock care. “I kept expecting they’d find the right antibiotic and then send me home, but that wasn’t the case,” says Bill, 70, a semi-retired attorney/social worker who used to bicycle daily throughout his Surprise neighborhood before experiencing increasing shortness of breath several months earlier. “It was hard not to feel helpless and anxious,” says Sue, who prayed by her husband’s side, day and night. Bill was transferred to Norton Thoracic Institute at St. Joseph’s Hospital and Medical Center in early March 2015. There, a team of specialists diagnosed him with pulmonary fibrosis, in which lung tissue thickens and stiffens, inhibiting the flow of oxygen. The cause of the disease remained a mystery, but specialists believed Bill’s best option for treatment was a lung transplant. But that wasn’t all: A thorough evaluation revealed Bill also needed a quadruple bypass surgery to repair heart damage due to inherited coronary artery disease. Within days of being added to a national organ procurement list, Bill was told his new set of lungs were en route. He was wheeled into the operating room on a late-Saturday night—the eve of Easter—for open-heart surgery, followed by an extensive double-lung transplant procedure. Sue, who prayed all night in the waiting room, recalls the moment she was approached Easter morning by Rajat Walia, MD, Jasmine Huang, MD, and Michael Smith, MD, with the news that surgery had been successful. The road to recovery is long, but Bill has returned to his part-time mediation practice, and he and Sue continue to count their many blessings. 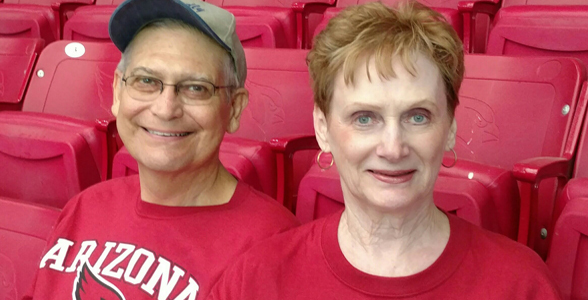 In gratitude for the care they’ve received, the couple has established a charitable gift annuity to benefit patient care at Norton Thoracic Institute. “We strongly believe that our assets are a gift from God and not really ours to keep, but should be used to help others,” says Bill.